What can happen when the broad-reaching power of the internet and the economic potential of e-commerce combine with the creative energy of Native American material culture? I'm in Arizona right now, attending and participating in the second annual tribal government e-commerce conference. 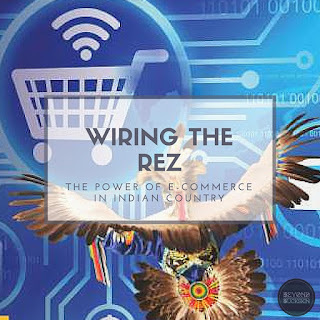 Hosted by ASU's Sandra Day O'Connor College of Law Indian Legal Program, this two-day conference explores the emerging world of Tribal Digital Sovereignty and the powerful potential of wiring our reservation communities. The internet, in many ways, is an important new tool that we absolutely must utilize and take full advantage of. Yes, there are dark corners (stay away from that! ), but there are amazing possibilities, especially when it comes to access and connectivity. For example, the internet provides us the opportunity to sidestep the processes of exclusion found in the elitist worlds of academia, the art world, Hollywood, and business (and, in Beyond Buckskin's case, the elitism of the fashion industry). But, to take full advantage of the power of e-commerce, we must build, maintain and update the infrastructures that facilitate economic growth in reservation communities. When I transitioned the Beyond Buckskin blog to also include a business component (the Boutique), I made a conscious decision to move back home and operate it out of the Turtle Mountains. I made this decision because of a thing called "brain drain" - the expected norm of our talented members forced to leave home because of a lack of opportunities and a lack of resources. While I currently handle the day-to-day business on my own (I am the only 'employee' of Beyond Buckskin), I am also planning our 2016 expansion project: we will be hiring 5+ individuals here in the Turtle Mountains to streamline our operation as part of our broader mission to bring economic development and opportunities to Indian Country. In making this decision, we have to work with the resources that are available, and we consistently battle basic problems: a blizzard sets the mail back a day, and 1-2 day shipping options just aren't physically possible (at all), the UPS driver can't locate our rural address so we must drive 80 miles to the nearest 'big' town to pick up a shipment, the internet frequently disconnects or is insanely slow, and there is no physical space or building to rent that adequately fills our needs as an e-commerce business that creates, markets, sells, and ships Native-made fashion daily and internationally. These problems definitely slow us down - they are legit struggles - but I also remind myself that this is the first time in history that people from throughout the world have the option to purchase authentic fashion directly from Native American people, all of whom maintain close connections to their tribal communities. And I think that is amazing. My primary question is always, "How can I make this mission streamlined, effective, creative, and sustainable?" And that word 'sustainable' is key - we have to create a system that works for longer than just a few years. This means that we have to be creative, we have to be flexible, and we have to be responsive to trends and new technologies while maintaining deep roots to who we genuinely, authentically, are as the Indigenous peoples of these lands. It takes small steps, but it is critical that we bring jobs back to our reservations however we can. I think I can help by making arts-creation a valid and important career path in rural communities. This is an important mission because many of our artists are also active participants in community-based projects and cultural and ceremonial practices, and are keepers and carriers of ancestral knowledge. We have the talent (there's so much talent! ), we just need to create an effective way (and not just an 'adequate' way) to get this amazing work out to a receiving audience. Right now, we only reach a tiny fraction of the potential supporters. I believe that the world will fall in love with Native-made fashion, if only they could just see it and access it. Throughout the two-day conference, we are discussing infrastructure challenges, the regulatory environment, partnerships, models of excellence, internet gaming, data security, and of course, e-commerce entrepreneurship. In this last session, we look at internet commerce in real life. There are so many challenges, but then again, there is so much potential. Keys to our success, I think, depend on working together, information sharing, good old fashioned hard work and research, and a willingness to try something new without forgetting who we truly are as members of important Native Nations. Click here and here to learn more. Click here to view the Wiring the Rez conference website. This means that we have to be creative, we have to be flexible, and we have to be responsive to trends and new technologies while maintaining deep roots to who we genuinely, authentically, are as the Indigenous peoples of these lands like run 3 new version.